Mary Belle Sparks, 93, of Nicoma Park, died January 31, 2019, at Wolfe Living Center in Harrah, Oklahoma. She was born October 5th, 1925 in Shidler, Oklahoma to Gregg and Lucy (Spurgeon) Echard. She married Robert “Bob” Sparks, August 8th, 1947, in Blossom, Texas. They were married for 63 years. 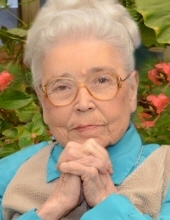 She was a long-time member of Harrah Church of the Nazarene, in Harrah, Oklahoma, where she faithfully performed many functions over those years. She has lived the last decade in the Wolfe Living Center where she made many friends. She served as the City Clerk for Nicoma Park for over 25 years, prior to that she worked for the Justice of the Peace and Ingraham Drug. She was preceded in death by her husband Robert “Bob” Sparks; son Stanley; grandson Tye, her parents, Gregg and Lucy; her sister Neva Erwin; three brothers, Delvin, Leo, and Hurley. She is survived by her brother Kenneth (Wanda) of Nicoma Park; two sisters-in-law, Jeanette of Aurora, Colorado and Nancy of Orchard Park, New York; four children, Jerry (Kathy) Sparks; Jacquita (Kenton) Daugherty; Keith Sparks all of Nicoma Park and Dale of Mesa, Arizona. Five grandchildren, Christopher (Susie) Sparks of Midwest City; Jeffrey (Alex) Sparks of Oklahoma City; Timothy (Annastacia) Daugherty of McKinney, Texas; Matthew (Sarah) Daugherty of Independence, Missouri; Jenna (Chase) Perrins of Anchorage, Alaska. Seven Great-grandchildren, Isaac and Zoe Sparks of Midwest City; Owen Daugherty of McKinney, Texas; Ava, Oliver, and Henry Daugherty of Independence, Missouri; Everett and Tobias Perrins of Anchorage, Alaska, and several nieces and nephews and many friends. To send flowers or a remembrance gift to the family of Mary Belle Sparks, please visit our Tribute Store. "Email Address" would like to share the life celebration of Mary Belle Sparks. Click on the "link" to go to share a favorite memory or leave a condolence message for the family.